[In May 1943] … I took another trip to Mexico that year but the studio was kind enough to be indirectly responsible for this one. Bob Coburn at Columbia had me pose in front of a poster of a Mexican bullfighter, imitating the bullfighter stance, and attired in a peasant blouse with an enormous hibiscus in my hair. Even I thought I looked Spanish. Bob liked the way it turned out and toted it over to the Mexican consulate; they were quite excited about it and wanted to know if they could use it as their official travel poster for that year. Of course, Bob, looking out for the best interests of Columbia, and I being on the Columbia payroll, said yes. And so it was arranged. Alexandro Buelna as Chief of the Department of Tourists invited me, in the name of [Miguel] Aleman, Secretary of the Interior, [later to become President], to come to Mexico as a guest of the Mexican government. He said Aleman was “so pleased” but that doesn’t begin to describe my feelings. It was such a great thrill. 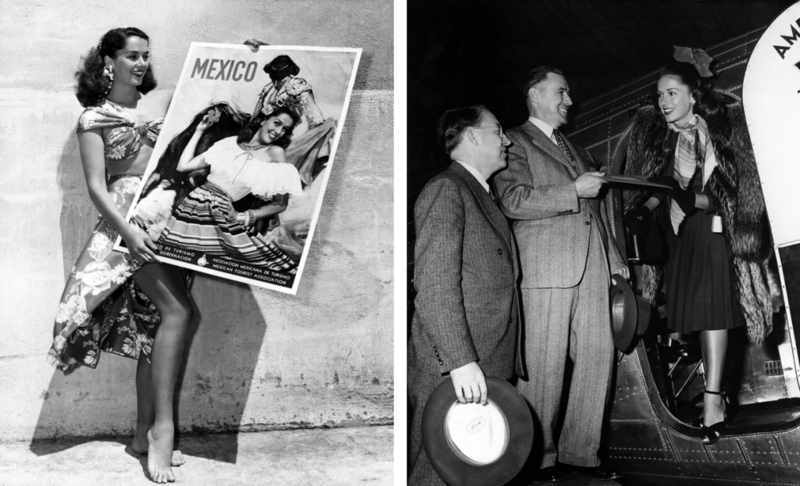 MEXICO HONORS JINX – As the first American girl ever to pose for the Mexican Tourist Association poster, Jinx Falkenburg, Columbia Pictures actress, is highly honored. Jinx, dressed in a sarong costume for her new film, “Song of Tahiti,” proudly poses with the poster being used for 1944 and ’45. America’s Number One Ambassadress to Mexico and Columbia Pictures’ Number One “Cover Girl,” Jinx Falkenburg, receives from Senor Vicente Peralta, Consul of Mexico at Los Angeles, a special invitation from Miguel Aleman, Mexican Secretary of the Interior, to attend the Los Angeles Pan-American Day celebration, while John Anson Ford, Chairman of Pan-American Day celebration in Los Angeles looks on. Photo to the right by Eddie Cronenweth.